← Can I Replace the Touchscreen in my Asus Transformer TF300? A broken laptop screen can be a source of great frustration. However, contrary to popular belief, laptop screen replacement requires very little technical expertise. In fact, some of our customers have managed to replace their first laptop screen in just half an hour. In completing this repair yourself, you could also save yourself time ad money. 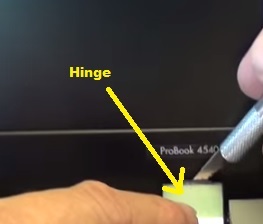 Below, we provide detailed, step by step instructions that will help guide you through the HP Compaq Probook 450S screen replacement process. Before beginning your repair, make sure that you have a.) unplugged your machine from the mains power and, b.) that you have removed the battery. Note: you should also make sure that you have disconnected any, (and all,) peripheral devices, (such as memory sticks.) When you're ready to begin, you'll need to remove the hinge covers, (found on the bottom 2 corners of the front bezel.) 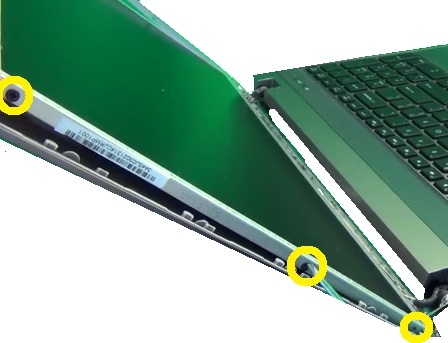 To do this, use a razor or a flat edged implement to work the covers away from the front bezel, (placing the laptop on its side to loosen them from the back, also.) Once you have loosened the hinge covers sufficiently, use a flat edged implement or an opening tool to prise them away from the machine. Once you've removed the hinge covers, you'll need to prise the aesthetic covers masking the front bezel screws away from the bottom corners of the front bezel, also. Once you've removed the screws covers, remove the screws hidden underneath and, set them aside. Next, use a flat-edged implement or your fingers to prise the front bezel way from the screen casing, working your way around each edge of the bezel. Once you are sure that you have loosened the front bezel sufficiently, (taking care, so as to snap it in the process,) remove the front bezel from the machine. Having removed the front bezel, you should see two screws at the top of the exposed screen. Remove both of these screws. Gently pull the top of the screen towards you, slightly and, remove the screws on either side of the display. 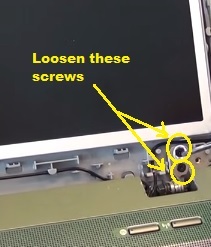 Note: to remove the lowest screw on each side of the screen, you'll need to loosen the screws on the bottom (front) of the exposed screen. 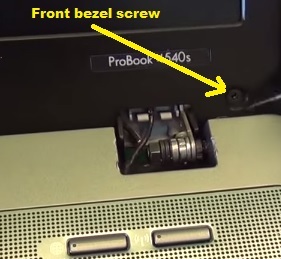 Pull the to of the screen towards you, taking care to disconnect the webcam cable attached to the top, (and back,) peeling back any tape if necessary. Next, lay the broken HP Compaq 4540S screen face down on the keyboard in front. At the bottom pf the screen, you should see a gold connector attached by a strip of adhesive. Peel back the adhesive and disconnect the connector. You should now be able to remove the screen from the machine. To fir your replacement HP Compaq Proboook 4540s screen, simply complete the above instructions in reverse, taking care to secure any, (and all,) cables properly.